So, just the other day I was having a bit of a browse around eBay. Nothing unusual there. As always I came to the stage of typing in ‘Zelda’. Again, nothing unusual. 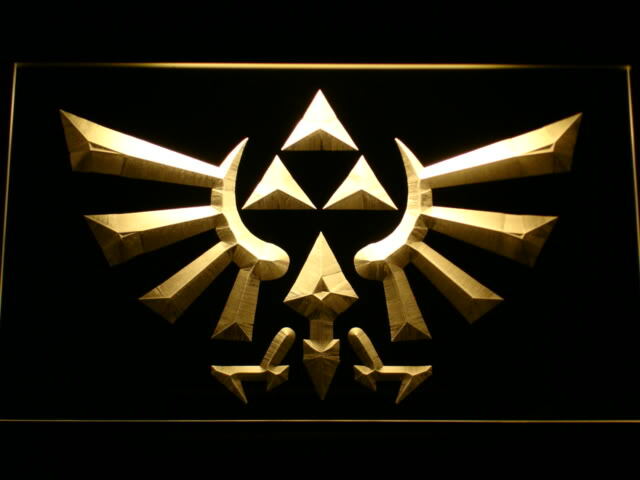 What was unusual was that my search results were dominated by ‘The Legend of Zelda Triforce Neon Light Signs’ – something I hadn’t come across before. It’d be a nice addition to any Zelda fan’s house, especially great if you happen to have a bar, but just as great on the bedroom wall for the rest of us. There is quite a lot of them around at the moment, well, at least on eBay. The neon lights are engraved in acrylic plastic in the shape of the royal crest of Hyule (as above), however you can select the color of your choosing for the light. The seller says it’s ‘The Best Light Sign Ever!’, and I can’t say I’ve seen any better in my experience, so they may be worth checking out. There is currently a limited stock of around 10 at $30US each. If you’re interested, check out the listing here.